Add this to your toolbox. 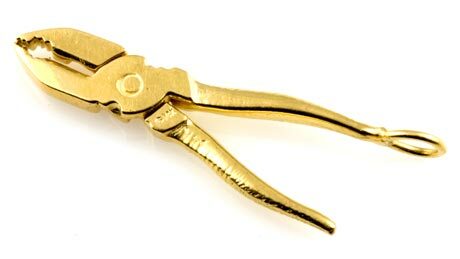 Cute little pair of pliers for that do-it-yourself gal. This "mechanical" charm actually opens and closes just like the real thing. This charm would be a great "go with" paired with the Hammer charm! Marked 14K. 39.6mm (1.56 in.) long including the bail. Weight is a hefty 3.9 grams.